HEIRLOOM. Delicious grey-green leaves turn purple in cold weather. This delicious grey-green kale is pretty enough to plant among the flowers. 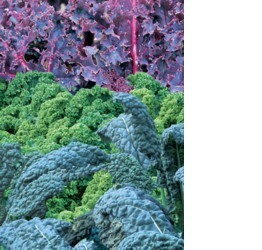 Much larger than regular kale (2 to 3 inch tall), the stems are purplish and the leaves are shaped like big oak leaves and colored a velvety gray green. The purple colors become richer after frost, when the flavor becomes sweeter. Surprisingly, the big leaves are very tender and delicious. Garden Hints: Kale requires good cultivation; mulch or hoe frequently to keep soil loose and weed-free. Plants may be left outdoors all winter. Kale, (also known as Borecole) is a member of the cabbage family, with a reputation for being able to grow anywhere. Kale is believed to have been cultivated for several thousand years and the original wild cabbage still grows around the shores of the Mediterranean. Its botanical name is Brassica oleracea acephala. "Acephala" means "headless" and unlike firm-headed cabbages, kale is distinguished by having no heart. The open form means the leaves accumulate more vitamins A and C, and more antioxidant carotenoids than heading cabbages whose tightly furled inner leaves never see daylight. Kale is also a good source of vitamins B6 and K and minerals such as iron and calcium. Phone: 09 2929474. Deliveries or collections: 97 Harrowfield Drive, Hamilton. 3210. New Zealand. Please call or email for an appointment to view. Please contact us if you are in a related business for wholesale/trade pricing & orders.